Derek Carr Is a Boring Pick. But Is He a Good One? Does it seem like Derek Carr should be the highest paid player in the NFL? 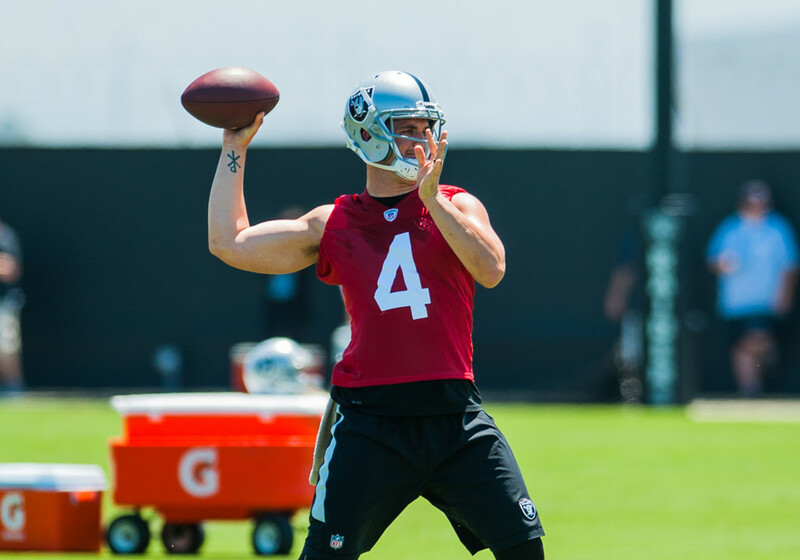 Carr signed a 5-year $125-million extension after a season that saw him emerge as a franchise quarterback before seeing his year cut short with a broken fibula in Week 16. The Raiders look like one of the bright young teams in the NFL, and they have one of the league’s best receiver duos in Amari Cooper and Michael Crabtree. Despite all that, Carr’s Average Draft Position is at 6.09. Here’s a graph showing Carr’s ADP over the past month using data from 12-team standard mock drafts. 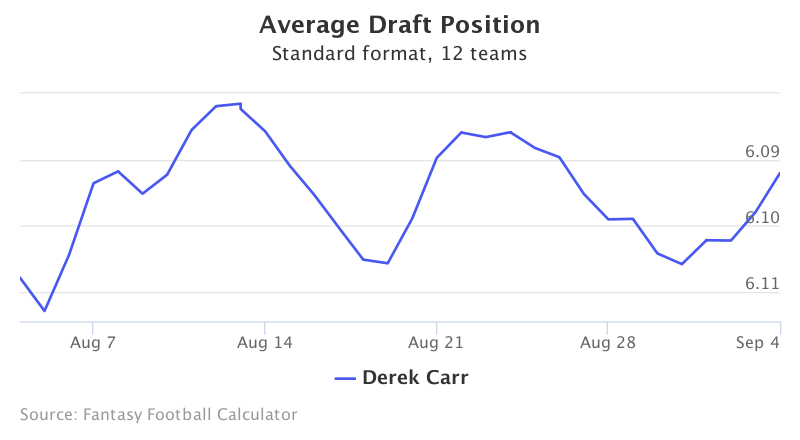 Carr’s ADP has been slowly dropping since he began February as a mid-5th round pick. He’s being drafted as QB6, shortly after more established stars Andrew Luck and Matt Ryan. Is he worth a 6th round pick? The answer probably depends on your draft strategy. The common narrative is that Carr broke out last season, but the numbers tell a different story. Carr completed 357 passes in 2016, compared to 350 and 348 his previous two seasons. His yardage decreased from 3987 to 3937, and his touchdowns dropped from 32 to 28. Carr did cut his interceptions in half. And he won. And it’s that latter one that jumpstarted the narrative. The Raiders were everyone’s feel good team last season, and Carr led seven fourth-quarter comebacks and took the Raiders to 12 wins. Winning games makes Derek Carr a very good NFL quarterback - but does it make him a good fantasy one? Is Derek Carr actually a good fantasy quarterback? In fantasy football, Derek Carr has not been an MVP. He hasn’t even been a strong starter. He’s basically been replacement level. Carr’s passing attempts have been steady year to year. His yards per attempt and touchdown rates have stabilized over the last two seasons. That’s nice and reliable but it doesn’t make Derek Carr a fantasy star - just consistent. Carr is… fine. He’s fine, really. He doesn’t run the ball much, averaging 100 yards a season without a rushing TD to his name. He doesn’t have many big games. He’s still recovering from a broken leg, and he now has a big lumbering back in Marshawn Lynch to steal some TD opportunities. There’s plenty of reasons to believe Carr is an excellent football player but not many that paint him as an excellent fantasy football pick. Why rush to take Derek Carr in the 6th round when you can take Cam Newton a round later, Jameis Winston in the 8th, Marcus Mariota in the 9th, or Dak Prescott in the 10th? There are so many good fantasy quarterbacks now, and it’s possible all of those guys have higher upside week-to-week than Carr. There’s still a lot of talent available in the 6th round. Carr is probably not going to lose your league, but he’s pretty unlikely to win it. He’s the sort of pick that builds you a nice, safe 4th- or 5th-place team. If that’s you, by all means. There’s a pretty good chance you’ll wish you hadn’t missed out drafting someone like Graham or Moncrief or Henry by midseason. Will you really regret passing on Carr? Derek Carr might be the highest-paid player in the NFL, and he may even be an MVP candidate. But he’s a boring and lazy pick on draft day.